The city is a major centre of art, technology, finance, publishing, culture, innovation, education, business, and tourism in Germany and Europe. 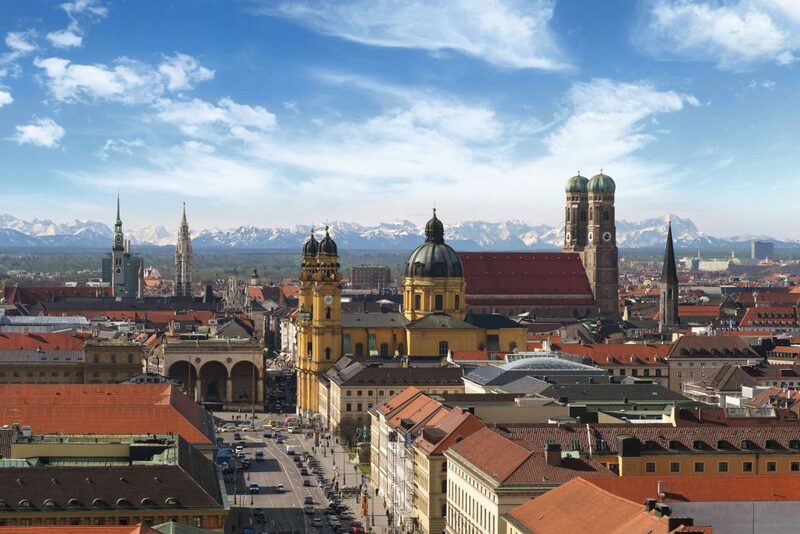 Munich enjoys a very high standard and quality of living, reaching first in Germany and third world-wide according to the 2018 Mercer survey, and being rated the world’s most liveable city by the Monocle’s Quality of Life Survey 2018. According to the Globalisation and World Rankings Research Institute Munich is considered an alpha-world city, as of 2015. The name of the city is derived from the Old/Middle High German term Munichen, meaning “by the monks”. It derives from the monks of the Benedictine order, who ran a monastery at the place that was later to become the Old Town of Munich; hence the monk depicted on the city’s coat of arms. Munich was first mentioned in 1158. Catholic Munich strongly resisted the Counter-Reformation and was a political point of divergence during the resulting Thirty Years’ War, but remained physically untouched despite an occupation by the Protestant Swedes. Once Bavaria was established as a sovereign kingdom in 1806, it became a major European centre of arts, architecture, culture and science. In 1918, during the German Revolution, the ruling house of Wittelsbach, which had governed Bavaria since 1180, was forced to abdicate in Munich and a short-lived socialist republic was declared. In the 1920s, Munich became home to several political factions, among them the NSDAP. The first attempt of the Nazi movement to take over the German government in 1923 with the Beer Hall Putsch was stopped by the Bavarian police in Munich with gunfire. After the Nazis’ rise to power, Munich was declared their “Capital of the Movement”. During World War II, Munich was heavily bombed and more than 50% of the entire city and up to 90% of the historic centre were destroyed. After the end of post-war American occupation in 1949, there was a great increase in population and economic power during the years of Wirtschaftswunder, or “economic miracle”. Unlike many other German cities that were heavily bombed, Munich restored most of its traditional cityscape and hosted the 1972 Summer Olympics. The 1980s brought strong economic growth, high-tech industries and scientific institutions, and population growth. The city is home to major corporations e.g. BMW, Siemens, MAN, Linde, Allianz, MunichRE and OHB Systems AG. Located in the South of Germany in the heart of Bavaria, Munich is very accessible by road, rail or air from most countries worldwide. The address for The Gasteig Cultural and Conference Centre is Rosenheimer Str. 5, 81667 Munich, Germany. The address for The Eurostars Grand Central Hotel is Arnulfstrasse 35, 80636 Munich, Germany. OHB have made arrangements with a booking agency, who have reserved a large number of rooms in Munich and the Munich area. Reservations for rooms over the duration of ESMATS can made via tms.aloom.de/esmats-2019. The availability of rooms under this scheme varies by hotel but closes between 22nd July and 1st August, 2019. Available rooms will allocated on a first come first serve basis. Early reservations are highly advisable. The 18th ESMATS will be held at the Gasteig Cultural and Conference Centre in Munich, Germany on the 18th to 20th September 2019. Deadline for abstract submission. Submission closed at 12:00 midnight CET time.